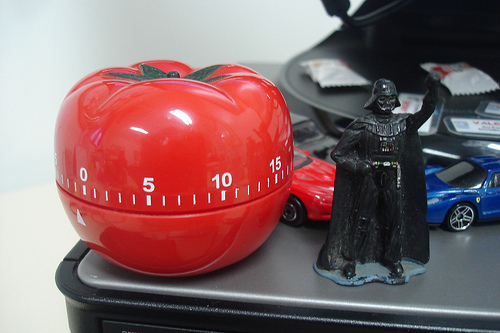 The Pomodoro Technique is a time management technique that prescribes twenty five minute blocks of undistracted concentration. It sounds great, but this article isn’t really about that. I didn’t know much about the Pomodoro Technique. Honestly, I still don’t. There is a free e-book you can read, but I have only skimmed it. What I picked up was that you work for twenty five minutes, take a break for five. And that is all I needed to know. A temptation when introduced to the Pomodoro Technique is to dive in the deep end. Read everything you can about it, buy a cute tomato timer (protip: pomodoro is Italian for tomato), print out some journal sheets, and slam it with everything you’ve got. This is undoubtedly effective, but suffers from a relatively high start up time and effort cost. Start up costs are the enemy of personal development. Here’s another approach: just start a twenty five minute timer. There is no way your brain can object to that. It takes literally seconds, and there is no cost or commitment. You are just starting a timer. It will expire in twenty five minutes. What happens between now and then … who could say? A month or so back I had a blog post I wanted to write and was having trouble getting started, so I just threw on a timer. That’s it. No journalling, no planning, no commitment to get anything done, just a simple alarm. Worst case scenario it is only half an hour I am not getting back. For the next twenty five minutes, I felt compelled to write. When the timer expired, I had half a post and barely even noticed the buzzer. I just kept writing. I don’t practice the Pomodoro Technique. I took one element from it, and that was enough for me. Anytime I sit down to write, or anytime I think I should write about something, I simply set a twenty five minute alarm. When it goes off, most often I plow right through. This morning I wasn’t sure how to get started, and it’s now two hours later and this is the second post I’ve written. I dabbled with respecting a five minute break but it totally killed my flow. I realise for longer productivity endurance there may be benefit—it is something I may try one day—but for a blog post that takes an hour or two to write once I get started I can sit down and bang it out. There are an overwhelming abundance of tips, techniques, and programs in which you could invest in the time management arena, let alone the wider personal development sphere. The real point of this post isn’t about setting a timer. That is one technique that worked for me at a time I needed it. The greater point is: If you can’t seem to adopt a new technique, or try a new behaviour, try taking just one thing from it and just doing it. It’s cheap and you can see quickly whether it yields you any improvement. It doesn’t matter if you’re not doing real Pomodoro, or not sticking to an exercise program, or not giving up cheese while going Vegan, or not getting all your lines everyday. See a problem, try something new, and fail fast.